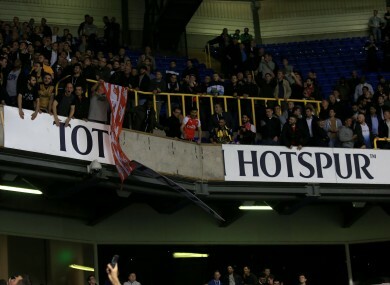 Arsenal fans tear down advertising signs in the stand after the team's 2-1 win at Spurs last night. A SECTION OF Arsenal fans are set to face an investigation from the police and the Football Association after tearing down hoardings at White Hart Lane following Wednesday’s League Cup victory over Tottenham. The fans are accused of pulling down perimeter boards at the stadium as they celebrated the crucial derby cup win over their fierce North London rivals, while they are also accused of destroying banners attached to the upper tier. Reports are also emerging that some Arsenal fans sang anti-Semitic chants on their way to the stadium, and it isn’t the first time such accusations have come to light. Two goals from Arsenal’s French midfielder Mathieu Flamini won the game for Arsene Wenger’s side and they go on to play Sheffield Wednesday away in the next round. Email “Police launch investigation after some Arsenal fans cause trouble at White Hart Lane ”. Feedback on “Police launch investigation after some Arsenal fans cause trouble at White Hart Lane ”.